Paladin is a highly rated, affordable New York City moving company and Long Island moving company. Paladin Moving Company goes back a long time—all the way back to 1966, when my father, Harry Lapham, founded it in the Bronx. Today, over 45 years later, Paladin can match or exceed any New York City moving company, and any Long Island moving company as well. As a small, family-owned and family-operated business with an outstanding reputation, Paladin has been able to generate business almost entirely through the glowing recommendations of our clients (see Testimonials for Paladin Moving Company). Thanks to our customers, and without the need for formal advertising, we’ve been the moving company of choice for residents of Manhattan, Brooklyn, Queens, the Bronx, Staten Island, and Long Island for decades. Paladin Moving Company truly understands the concerns families in New York City and Long Island have when choosing a moving company, including the character of strangers coming into their home, and the potential for damage to their property and personal belongings. The moment we arrive, Paladin will make you feel comfortable, thanks to our staff’s professionalism and our clean, beautiful trucks and other equipment. If you need a New York City moving company or Long Island moving company, read more. Paladin is a New York City moving company and a Long Island moving company, serving Queens, Brooklyn, Manhattan, the Bronx, Staten Island, Nassau, and Suffolk. The company is licensed and insured with the Department of Transportation. As required of every moving company by the D.O.T., Paladin provides every client with a booklet containing a summary of information for shippers of household goods. This booklet with give you information that will keep you from making mistakes that could result in the loss of your time and money. 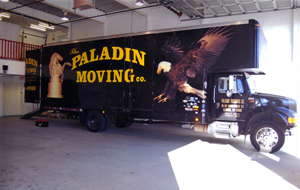 Read more about Paladin Moving Company's services. Today I was moved by your company, and was very pleased and satisfied with their performance. I would highly recommend your company to anyone I know who is moving. Everything was properly wrapped, and nothing was broken or chipped. Most of all, the fellows themselves were very pleasant and polite. Thank you for your services. Read more testimonials for Paladin Moving Company.